For your convenience we offer regularly scheduled online Webinars on Tuesday and Thursday mornings at 10:00 a.m. CST. Simply click on the "Register Now" button of the Webinar you wish to attend, and you'll be able to choose from a variety of dates in the coming weeks. If you can't find a date that works, just give us a call toll-free at 1-888-957-3438 and we'll arrange for a "private screening" just for you. In this 90-minute Webinar, hosted by Bill Sherman, you'll learn about our unique market viewpoint and the market strategies we employ. You'll also learn how The Sherman Sheet can dramatically improve your practice, as it has for many others. We will explore the historical foundations for our approaches to the market, and we will show how our multi-timeframe analysis of market conditions leads us to a firm grip on "where we are" so that we can always know what to do. If you have just started a 30-Day Free Trial, this Webinar is for you. 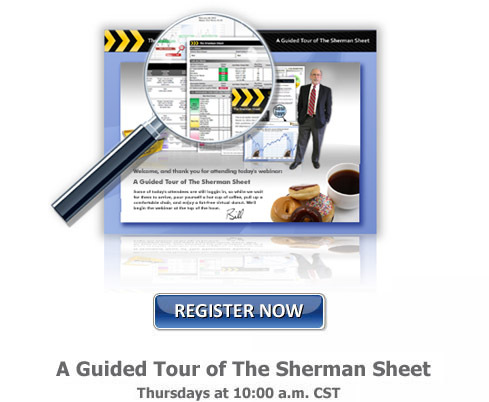 Even if you are simply considering taking the 30-Day Free Trial, this Webinar will help you decide if The Sherman Sheet is right for you. 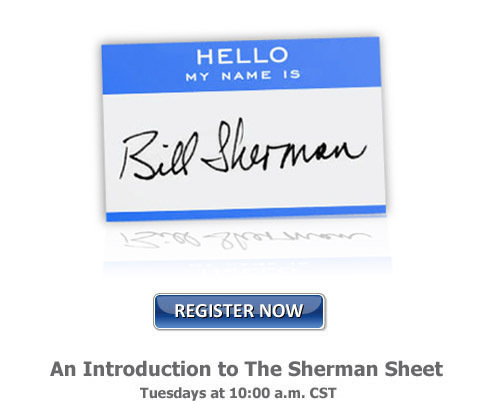 In this 2-hour Webinar, hosted by Bill Sherman, we'll explore everything you get with a Sherman Sheet subscription. You'll learn about each of our models with emphasis on applicability to wide varieties of client circumstances. We'll explore our ranking tables for asset classes around the world, and finally, you'll learn how to make use of our acclaimed Custom Reports feature, which gives you individualized analysis and portfolios for your clients' unique 401k's, VA's, mutual fund families or other client-specific portfolio needs. This Webinar is a "must-see" if you are in your 30-Day Free Trial, and is also a great refresher for current subscribers or their staff members. If you have not already viewed our 10-minute video Introduction to The Sherman Sheet, you may wish to do so before attending either of the Webinars above. If you have not already signed up for your 30-Day Free Trial to The Sherman Sheet, click here. To go directly to the Gotomeeting.com web site to join a personal webinar you have previously scheduled with our Gordon Case, click here.